Now that we have a better understanding of what's happening under the hood of a 10x passive oscilloscope probe, we can sum up its key characteristics. The first thing to know about such probes is that they offer relatively low bandwidth (<100 MHz). This is largely a result of the probe's tip inductance. A 10x passive probe is going to exhibit a relatively low signal-to-noise ratio (SNR). For one thing, you give up 20 dB in SNR simply due to the fact that the probe attenuates the measured signal at a rate of 10:1. SNR will also suffer as a result of RF pickup by the probes' long leads that are great receiving antennas. Figure 1 illustrates an example: the yellow trace is the oscilloscope's inherent noise while the magenta trace is a 10x passive probe with the leads shorted together. The oscilloscope noise is in the range of 0.5 mV peak-to-peak, while the probe with shorted leads is about 30 mV peak-to-peak. This comprises a combination of the oscilloscope noise and the fact that the noise is about 10 mV/div at the tip, but it's 1 mV/div measured at the oscilloscope. On top of that is another 30 mV peak-to-peak of RF pickup noise from the probe's long wires. Hence, we want to do whatever we can to reduce the tip inductance to gain higher bandwidth and less RF pickup. 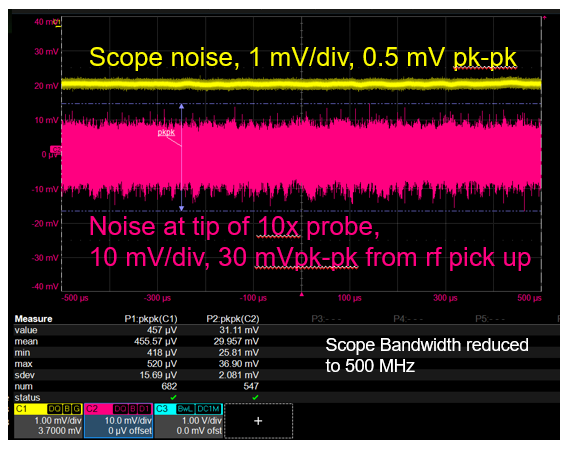 With a 10x passive probe, make sure to always use the 1-MΩ input on your oscilloscope. You can AC-couple it, which inserts a high-pass filter that will prevent you from seeing any frequencies below 10 Hz. With all of that said, the 10x passive probe makes for a great general-purpose, low-bandwidth probe. By using a coaxial tip, one can achieve the 10x passive probe's maximum possible bandwidth. Never expect more than about 500 MHz from a 10x probe, even under the absolute best conditions. But what if you want to improve the probe's bandwidth while maintaining high impedance? One way to accomplish this is to use a coax cable with a 450-Ω resistor in series at the tip of the probe. This is a completely different probe design than the 10x passive probe, such as the Teledyne LeCroy PP023, as described above. These probes with a 450-Ω resistor are sometimes referred to as "transmission-line probes." They are also 10x attenuating probes and use the 50-Ω input of the oscilloscope as the other half of the voltage divider, but they have much higher bandwidth than the 10x probes that use the 1-MΩ oscilloscope input. The impedance load seen by a DUT is 500 Ω from DC all the way up to their ~7-GHz bandwidth. With this configuration, we want to use the oscilloscope's 50-Ω input as the termination. 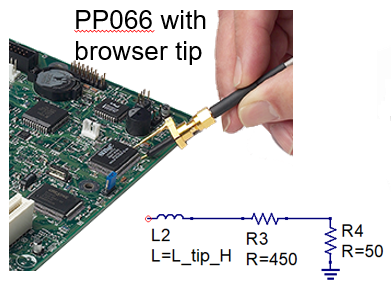 Figure 2 shows a Teledyne LeCroy PP066 10x passive probe with what's known as a browser tip. There's a 450-Ω resistor in the tip that touches down on the component as well as a separate return path. That return path is very short, which helps us to minimize the tip's loop inductance. Then the signal sees the 50 Ω of the cable, so it's 450 Ω plus the 50 Ω of the cable terminated into the 50-Ω oscilloscope input. Bear in mind that this voltage-divider arrangement is attenuating the signal by 10x, so the signal we see at the oscilloscope is 1/10th of the signal at the probe tip. Meanwhile, sensitivity to loop inductance is greatly reduced due to the smaller resistance. With the 450-Ω series resistor and with smaller tip loop inductance, we can typically get the -3dB point for a 10x passive probe into the 5-7 GHz range. You don't need the browser tip to get there either; you can roll your own by adding 450-Ω resistors to the test points on your PC board. To summarize, when you see that 450-Ω series resistor, know that you're surrendering 20 dB of signal. This isn't a problem if you're probing volt-level signals, but for signals in the millivolts, you want to look at preserving the SNR. You can achieve fairly high bandwidth by minimizing the tip loop inductance. But, you can't AC-couple the probe in this configuration unless you use an external coaxial DC blocking capacitor, which means a high-pass filtering frequency of about 1 MHz, so you wouldn't be able to see any frequencies lower than that. Next time, we'll look at what happens if you use only a 50-Ω coaxial cable between the DUT and the oscilloscope. Is three an alternative probe to the transmission-line probe PP066, which is not available anymore?